Suunto is a Finnish company that designs and manufactures sports precision instruments for training, diving, and outdoor sports. Suunto wrist-top computers combine the aesthetics and functionality of watches with sport-specific computers. Headquartered in Vantaa, Finland, Suunto employs 500-plus people world-wide and distributes its products to more than 100 countries. The company is a subsidiary of Amer Sports Corporation, which manufactures a variety of sports brands such as Wilson, Precor, Atomic, and Salomon. In spring 2010, Suunto launched Movescount.com, a unique platform that allows sports and fitness enthusiasts to easily "manage their moves" by uploading, rating, tracking, and engaging with other likeminded members. Movescount.com launched in May 2010 and received over ten thousand members in its first 10 weeks, with over 300,000 moves tracked. The site is steadily growing with the goal of becoming a best of breed sports community site. The main purpose of the site is to provide authentic visibility in social media. Janne Kallio, Digital Marketing Manager for Suunto, explains that “Movescount.com is not only a great service for the sports community, but it’s also a huge step for Suunto in digital marketing. Movescount.com offers a totally new opportunity for Suunto to provide great tools for daily sport tracking and engagement through social media for sport enthusiasts." 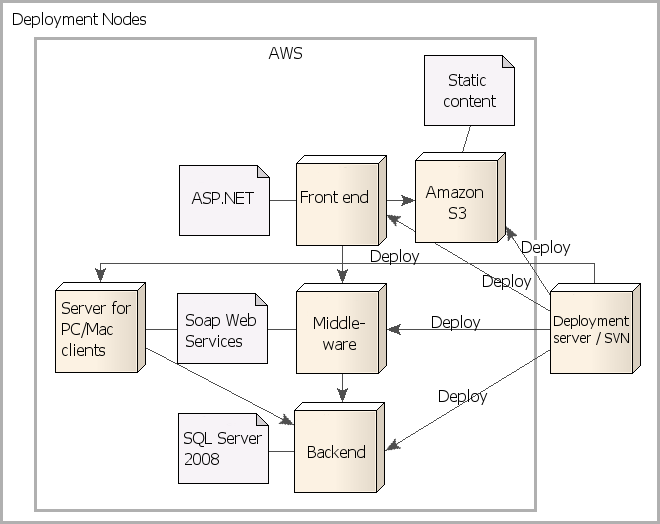 Movescount.com has incorporated AWS into its architecture for development, testing, and production, as shown in the diagram below. The site also launches servers for performance testing and security testingas needed. The architecture is based on layers—user interface, business logic, and database. A web service layer is used for external service integration and load balancing ensures reliable performance, which can be scaled up or down in the business logic layer. The Content Delivery Network (CDN) is used to provide static content such as images. Amazon Simple Storage Service (Amazon S3) is used to store the site’s static content. Movescount.com also uses Amazon Software Development Kits (SDKs) to upload the static content to Amazon S3. The Amazon S3 Organizer is used for Amazon S3 maintenance, and Elastic Fox is the interface to the management console. Programming languages and tools include .Net, C#, Visual Studio, Visual Build Pro, Microsoft Windows Server 2008, and MS SQL Server 2008. As the site continues to grow, Kallio credits AWS as an enabling component. "The scalability, ease of hosting, global mindset, large reference base and cost efficiency of AWS have enabled us to create and deploy this best-of-breed sports community site," Kallio says. With an eye to incorporating additional AWS tools into its solution, Movescount.com is researching AWS monitoring tools, which would help identify potential problems as they happen. To learn more about how AWS can help run your websites in the cloud, visit: http://aws.amazon.com/websites/.